Lord Singh was raised to the peerage as Baron Singh of Wimbledon, of Wimbledon in the London Borough of Merton in 2011. He is a crossbencher. 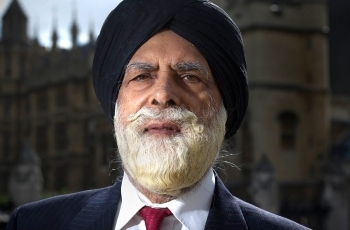 Dr. Indarjit Singh OBE CBE was the first turban-wearing Sikh to join the House of Lords when he was appointed in 2011. He is also currently Director of the Network of Sikh Organisations, as well as treasurer for The Interfaith Network. Singh studied Engineering at Birmingham University. He worked as a miner and civil engineer until beginning his life work of giving the Sikh people a voice. He co-founded the Interfaith Network for the UK and wrote newspaper articles. He was assistant editor for the Sikh Courier and started his own publication The Sikh Messenger, of which he is still editor. He is also often featured on BBC Radio 4's Thought for the Day segment. Singh is frequently called upon to represent the Sikh community at events such as the Cenotaph Remembrance Service, Westminster Abbey Commonwealth Day Service, and even the royal wedding. He made history in 2008 when he became the first Sikh to address an audience at the Vatican; in his speech he advocated for tolerance of different faiths. In 1989 Dr. Singh was the first non-Christian to receive the Templeton Award for services to spirituality, and in 1991 he was awarded the Interfaith Medallion for services to religious broadcasting.